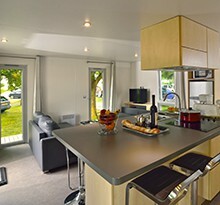 Flower now offers a range of luxury camping accommodation combining the famous Flower ethos with extra comfort. Our spacious, fully-equipped, designer luxuary mobile homes come complete with a hotel-style service package and half-board option. Dishwashers, flat screen TVs, barbecues and double bathrooms are just some of the luxury features which give each model its own particular charm. Everything you need to make the most of your upscale camping holiday. A wide range of luxury suites and designer accommodation guaranteed to meet all your expectations. Sleeping two, four or six adults and measuring between 25m² and 40m², these prestige mobile homes also offer a number of extras. Some even have a private outdoor spa! Included in the price of every luxury suite and also available in our designer residences, our Premium Pack includes sheets, towels and tea towels, a cleaning kit and a set of complimentary toiletries. And you’ll find the beds ready made up on your arrival. For a little extra luxury, you can also order your very own breakfast basket. 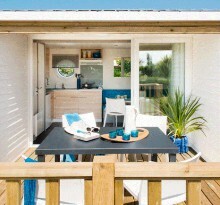 This 5 star campsite in France now boasts a number of brand new, spacious and modern mobile homes which promise 40m² of comfort and luxury. Enjoy the holiday of your dreams with a view over the Château de Saumur. Offering all the latest in fixtures and fittings, including a brand new island kitchen design, additional sound insulation, memory foam mattresses and a light well, it also has a fully equipped outdoor space. This mobile home sleeps up to 4 adults and 2 children under 12. Measuring 30m² and designed to sleep 4, the charm of this luxury mobile home lies in its central patio which provides the ideal connection between inside and out. Fully equipped to the highest standards, it has two bathrooms with spacious showers, air conditioning and is set in a large private outdoor space. There’s even a half-board option available in July and August for those who really want to take it easy! Set on the edge of the woods, these luxury lodges blend in perfectly with the natural environment. They comprise a master bedroom with double bed, en-suite bathroom and separate toilet, a second bedroom with two single beds, a third bedroom with two single bunk beds, a bathroom and a separate toilet. You’ll also find a fully equipped kitchen with top-of-the-range appliances including microwave, fridge-freezer, electric hob, extractor hood and dishwasher, and a living room complete with TV. 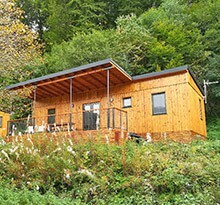 A haven of peace, our designer lodges really do offer all mod cons. The ideal place to relax and recharge your batteries! 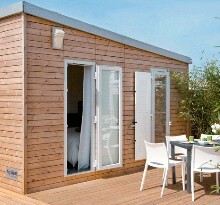 You are looking for a luxury camping in Brittany ? 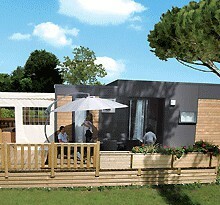 Les Capucines's mobile homes for VIP offer : 1 bedroom with double bed (160cm x 200cm), shower room wish wash basin, separate wc, 1 bedroom with twin beds (80cm x 190cm), shower room wish wash basin, wc - 1 bedroom with bunk beds - Kitchen equipped with tableware and cookware, dishwasher, coffee machine, micro-wave, sink, 4 gas burners, fridge-freezer - Lounge with TV - electric heating throughout - Patio with private SPA - barbecue, parasol , clothes airer. 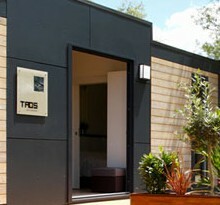 The + points: 3 bedrooms - 2 shower rooms - dishwasher - Private SPA - Sorry no dogs in this property.